Main tab – Contains period of performance, agency name, budgeted amounts, funding source, PI and award number identification. Grant Agency tab – Contains the agency’s address, contact name, and phone number if provided. Location tab – Specifies whether the work performed on the award is on or off campus. Cost Code tab – Displays the indirect cost rate approved by the agency for the award. Personnel tab – Displays the name of the PI, Fiscal Monitor overseeing the award and the EEC Reviewer and EEC Admin designated by the department. Billing tab – Displays the billing details utilized by Banner to run the billing process. User Defined Data tab – Displays information on the budget pool type, special reporting requirements, research type, invoicing and financial reporting instructions. Effort Reporting tab – Displays the fund numbers set up for effort reporting. Pass Through Agency tab – Displays the name of the pass through agency for flow through awards. Sponsored awards are tracked by the responsible College/Research Center to determine which department they belong to. The Responsible Organization Code is designated on the Main tab in FRAGRNT. Below is a list of Responsible Organization Codes assigned to awards. Large Pool – There are no restrictions to spending within line items of award budget. Expenses must remain within project scope or objective. Large Pool with Restrictions – Award states expenses can exceed a certain percentage variance before requesting agency approval. Small Pool – Agency approval is required for any budget deviations. The Fund Maintenance form FTMFUND identifies funds assigned to a G# and contains important information utilized for tracking Unbilled Accounts Receivable (A/R) and Revenue Account Code information. Below is a list of the account codes by funding source. 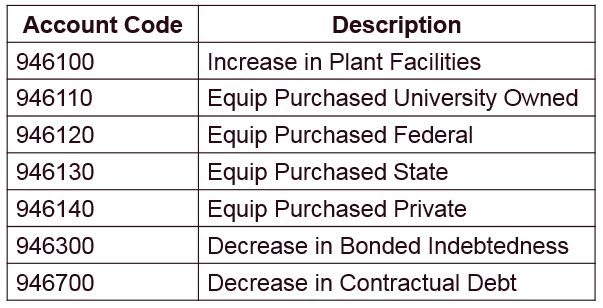 FTMFUND tracks the Capitalization Equipment Account, which indicates where any property/equipment purchased on a sponsored award will vest after completion. The capitalization account is a required field; therefore, if a sponsored award has no equipment purchases, the capitalization account defaults to 946110-Equipment Purchased University Owned. FTMFUND also tracks the NMSU campus that will retain ownership of equipment purchased on a sponsored award if it pertains to NMSU. 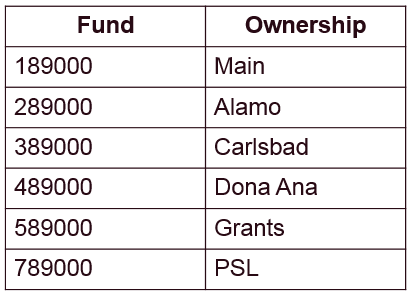 Below is a list of funds for the different campuses. The Research Accounting Fund Maintenance form FRMFUND tracks the billable indirect cost rate (IDC) approved by the agency and the codes for proper IDC recovery and distribution. The “distribute to” codes could differ between funds on a sponsored award if a portion of funds is awarded to another department within NMSU. This is referred to as an “internal award”. The IDC rate on internal awards can also differ from the prime award as the IDC rate assigned will be either the prime award’s approved rate or the internal award’s department IDC rate, whichever is lower. FRMFUND also tracks the period of performance at the fund level. Some sponsored awards contain funding for budget periods that differ from the overall period of performance of the award. This form accommodates those differences for individual fiscal administration tracking purposes. The Billed Accounts Receivable code per funding source is also assigned on this form.